Play at work! Isn’t it sounds quite interesting? Well, beating your competitors is not only possible by simply making you engaged in work all the time. In today’s era, there is a great need to make you clear the real meaning of competition and success. Merely, having an understanding is not enough, if you are not given an environment to relax your mind to improve you and your business success. Well, to help many of the industries, there is a concept of gamification that proves to be a boon for the business world. Most of the companies are adopting this technique for motivating and encouraging their employees to boost up their performance. No matter even if you are doing the best work in the best possible manner, it always demands something creative and interesting to make us enjoy our work. Gamification is a scientific technique that is widely tested and proven in many large organizations. The combination of game and technology is the best approach to make employees always ready for the challenges in their professional life. It’s nothing, just simply a streamlined, accessible path to figure out ways to create alignment with incentives and motivation. The productivity, agility and engagement of the employees can be improved in an effective manner using this latest tech trend. By adopting the methodology of Gamification in our day-to-day life one can improve the involvement of employees, optimize the internal process, and achieve higher conversions, greater loyal customers and more. Game thinking and game mechanism build the potential of the employees and employers to help them solve their business problems in the best possible manner. Communication, confidence, trust and efficiency, training and boosting work culture are essential things that can be easily resolved with the highly mechanized technique of gamification. It is so engaging that it actually changes the brain chemistry of the employees, making them react to every business challenge confidently to deliver their best. 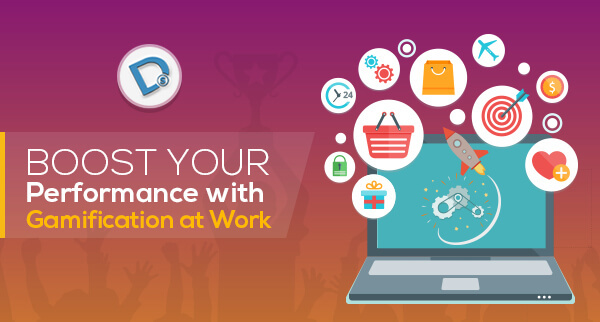 With an idea to create a desire to do more in your employees, create an engaging environment of gamification at your workplace to engage and accelerate learning.